This year is the 40th anniversary of The Prince Edward County Community Care for Seniors Association. The organization will celebrate its long history of helping seniors live at home at a special event on October 12th, 2017 at Rotary Hall at the Prince Edward County Community Centre. As part of these celebrations, it is profiling some of the many volunteers who deliver its services into the community. Guest columnist, Peter Lockyer. Like many County youth, Barb Proctor left the area in the 1960s to pursue educational and career opportunities elsewhere. She trained as a nurse at the Oshawa General Hospital and ultimately, became surgical suites manager for hospitals in the Greater Toronto Area – a career that spanned 35 years. Soon after moving back to Prince Edward County in 2002, she was providing home care nursing, an experience that shaped the next stage of her life. In 2008, Barb ended her working career and took up a new challenge as a councillor in local government taking a specific interest in the needs of the County’s seniors – or “older adults” as she prefers to say. Prince Edward County has the second highest proportion of seniors in Ontario and the fifth highest in Canada. She brought her expertise as a health care professional to her council position in reviewing the needs of the County’s many older citizens, and the value of volunteer organizations such as Community Care in assisting older residents to live independently in their homes. The organization has over 500 volunteers donating their time to provide a wide range of services – everything from transportation to medical appointments, to delivered meals, foot care and social activities. Barb joined the board of the agency in 2015 and is now its current chair. As a former nurse, Barb also says the organization and its volunteers are providing key services to seniors and their families. All of the organization’s services are focused on supporting a healthy, independent lifestyle for seniors and their families. Without these supports, many older adults living on their own after the loss of spouses, friends, and their health find life very difficult. 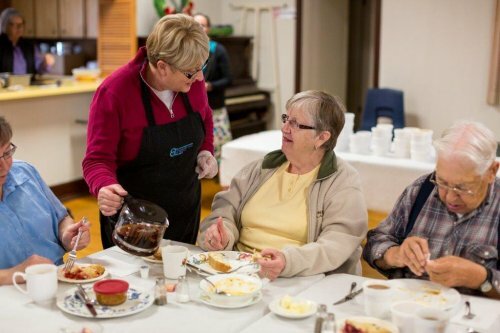 Connecting older adults with their community and providing services to assist them to live at home is a primary mission of The Prince Edward County Community Care for Seniors Association. Through its many services, the organization is meeting the needs of County seniors while creating volunteer opportunities for local residents. It’s a cost-effective model with widespread community benefits.